Nipa Soni is a servant of the aristocracy of Alabast. From a family of refugees from Secundo Alabasta, now indebted to the adjudicators. She is a hopeful girl trying to earn the freedom of her family. Several years ago, Nipa's family came to Prima Alabasta to escape the impoverished nation of Secundo Alabasta. Indebted to the government that has harbored them, Nipa and her family must serve to pay off their debts. 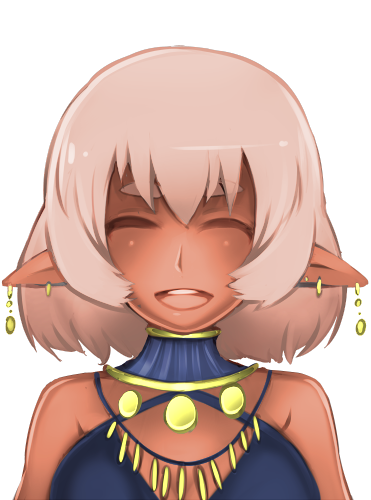 Today's character update is rather small, because not much about Nipa could be explained without spoiling the story. In addition to this, the next two characters are big updates because these two characters will include extra story about how Alabast works. The pictures are also more special and much further along in design. So expect a day delay between the reveals of these last two characters! However I'd also like to talk about a few things regarding Vagabond and Dizzy Hearts as well. As other people pointed out, some of the clothing designs for Vagabond are not done yet. These pictures are more to show off the character designs in general. You can look forward, after Dizzy Hearts, to see further along reveals of the characters of Vagabond, their story, including more character bios, and character sheets. There are also two stretch goals now related to Vagabond. Instead of the full game for $25k, the game can be made at $16.5k at 500k words, instead of 1mil. This is mostly based on request and also to be as realistic as possible about my chances of funding. However if it does hit $16.5k, I will be doing a major reveal of the Vagabond story ahead of time! I'll also add that there are several clothing designs that are missing from Dizzy Hearts. Each character will have 4, maybe even more outfits, but for this demo they are missing and mostly just rough concept art now. With the game so close to being funded, I'll be able to reveal these designs over this Kickstarter and development!